a) Say, yes of course, ask for more - you deserve it! b) Point out that the salary on offer is actually quite reasonable for the work expected and he/she can't really ask for much more. Rock & a hard place, right? Option b is technically the correct answer, but option a will get the irritating colleague out of your hair (and soon! )- a case of good bye and good riddance! Unlike my lovely colleague, chicken salad is something that I definitely do not want to banish from my life. In fact, I don't think you can ever really get enough of a good chicken salad. This particular incarnation is one I've been making for a few years now. First gleaned from the pages of an old Marie Claire magazine, I've chopped and changed a little bit since then. The flavours are clean and fresh and reminds me of the type of food that you would eat at a spa (or at least what I imagine spa food would be like! ), hence the name. 1. Preheat the oven to 180C. Mix sunflower oil with 1 tbsp lemon juice. Pour over chicken breasts and toss to coat. Place chicken in a small baking dish, cover with foil and bake for 30 minutes, or until cooked through. Remove from oven and allow chicken to cool off completely. 2. 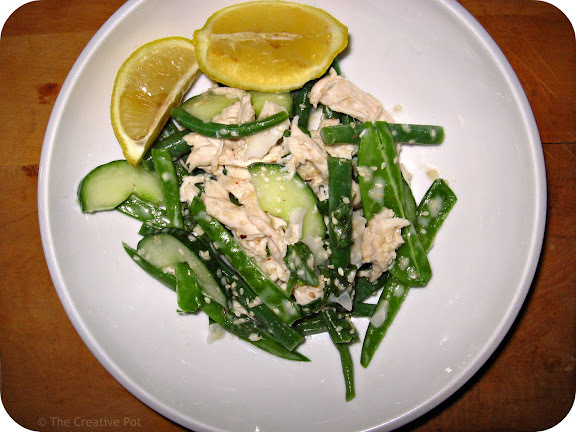 Meanwhile, make a dressing by combining the remaining lemon juice with coconut milk, sugar and lemongrass (if using). Simmer for 5 minutes, stirring to allow the sugar to dissolve. Remove pan from heat and allow dressing to cool. 3. Steam/blanch the beans until just starting to soften (it should still retain some crispness). Refresh under cold water to stop the cooking process. 4. Roughly shred the chicken and combine with the dressing in a salad bowl. Add the beans, cucumber, mangetout, mint, chili flakes, coconut and sesame seeds and toss well. Season to taste and serve with lime wedges. If you find a spa where they serve this food, let me know and I am booked immediately!!! Looks light and so refreshing!!! You took chicken salad to a whole new level with this! I could see it becoming a personal favorite of mine. I love that it doesn't have any mayo! Don't worry Joanne - the circumstances swung my vote to the selfish side too. Enjoy the salad! I agree with Nina - if this is what spa food is like, I'm there like a bear! :-) Agreed! Perhaps we should start our own spa with this type of food? perfek vir die somer! en ek is saam met jou oor die wonder van hoenderslaai, dit bly net 'n treffer.